What Is Jus (Au Jus)? Jus (pronounced "ZHOO") is a word used to refer to the pan-drippings from roasted meat, which is generally enhanced by deglazing the pan with stock and then simmering the liquid with mirepoix before straining and serving. Roasted meats and poultry that are served with their own jus are described as being prepared "au jus." Examples include roast rib of beef (sometimes called prime rib) au jus. Unlike pan gravy, jus is unthickened, although there is a thickened version of jus, called jus lié ("zhoo-lee-AY") or fond lié ("fohn-lee-AY"), which is prepared by adding cornstarch or arrowroot to brown stock and then simmering. Poultry, lamb, and veal can also be served au jus. Jus is also a traditional accompaniment to something called a French dip sandwich (or beef dip), which is a sandwich made with sliced roast beef on a baguette-style bread and sometimes caramelized onions and cheese. 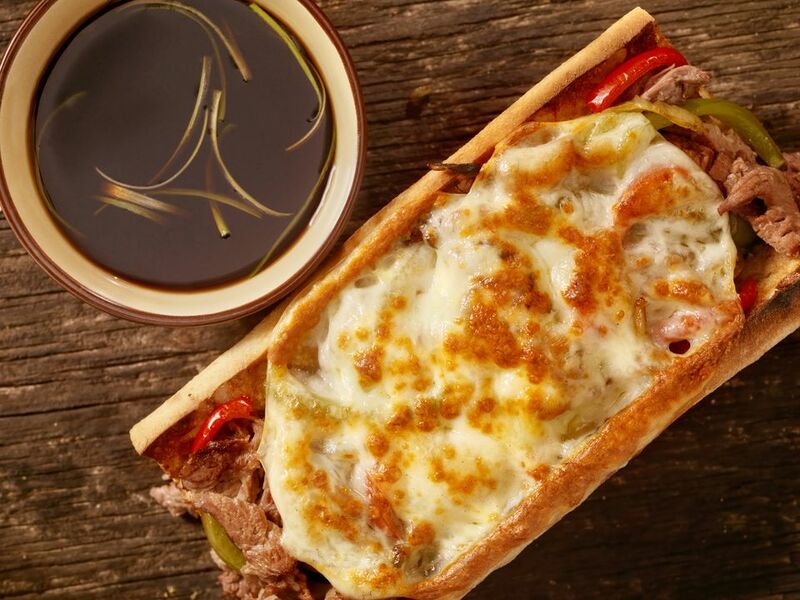 French dip sandwiches don't come from France. They originated in Los Angeles, and are probably called French dip because of the bread. The jus is usually served in a small bowl or jug and the sandwich is dipped into the jus.